Tastes in Classical Music fluctuate almost as much as tastes in fashion; although mercifully never reaching the ridiculous extremes of the latter, largely because in music taste is driven by individual consciousness rather than commercial pressures or public relations executives. There was a time when we loved our Bach on the piano; then we hated it, now we love it again. A time when the Grieg was the last word in piano concertos; some students today have never even heard of the work. Luigini's Ballet égyptienne was once the passion of the time; who's heard of it today? Remember the fervour with which the Bax symphonies were greeted when Lyrita brought them out on record? ; they are all but forgotten today. And the once ubiquitous Crucifixion by Stainer is commonly dismissed by the musical Gestapo as "hideous Victorian tat". For years I've been sounding the clarion call for Havergal Brian's Gothic Symphony after what was billed as a "once-in-a-lifetime" performance of it in the Royal Festival Hall featuring, among hundreds of others, my old school choir; now it's being performed at the Proms. I can go on forever with such examples, but one particular one springs to mind with a recent review I wrote for a US review website. As a church chorister I had sung choice extracts from Elijah as anthems, but I had no idea that "Lift thine eyes" and "O rest in the Lord" were actually part of something larger – much as choristers throughout England think L'Enfance du Christ is just another name for "The Shepherds' Farewell" or Brahms's German Requiem contains just one movement, "How lovely are Thy Dwellings". My first exposure to the totality of Mendelssohn's great oratorio came when as a student in the 1970s the university choir and orchestra chose to perform it. It was the cause of a certain amount of controversy, the more "learnéd" members of the faculty objecting to the promotion of what they roundly condemned as substandard and trivial music. Mendelssohn was seen as a ghastly 19th century aberration, the subject matter as irrelevant and the musical language, involving a large orchestra, a large choir and a body of soloists, overblown. This was, after all, the age in which we were all busily experiencing for the first time "period instruments" and "authentic" performances, while there was cutting edge stuff being produced by a host of composers for whom Darmstadt was every bit as important then as Mecca has always been for Muslims. This first exposure to what many now claim to be one of the greatest oratorios after Haydn was rather clouded by the fellow who stood next to me in the tenors, a composition student who was also studying voice and had become a fervent Christian during his time at University; a nightmare combination! As a composer he took every opportunity to point out despicable flaws in Mendelssohn's scoring, frequently emitting a loud bark of forced laughter when we reached one of - in his view – Mendelssohn's great solecisms (he was particular taken by the appalling idiocy of ending the first part with a simple V7-I cadence). As a trained singer he enjoyed nothing better than to stop a rehearsal in order to ask rhetorically how any tenor was expected to pitch such "idiotic" intervals as the tritone in the last bars of "Thanks be to God", and as a late but enthusiastic convert to Christianity he spent every post-rehearsal session in the pub loudly deriding the flawed theology of the English libretto. How could one not be affected by such a constant stream of criticism at each and every rehearsal, and I have to confess that I came to regard Mendelssohn's Elijah as something of a joke. However I was absolutely shocked when the Kurt Masur recording of it (left) was nominated in the choral category of the Gramophone Awards in 1993. I have to confess I listened through it and was absolutely smitten, but I never thought my voting colleagues would be able to cut through the years of accumulated anti-Elijah bias which still afflicted the musical world. Nevertheless it went on to win and effectively rehabilitated a great work in the eyes of the musical world. There's no doubt that the Masur recording on Teldec remains a yardstick; there are some priceless moments (the delicious "Lift Thine Eyes", the spine-tingling thrills of "Behold, God the Lord passed by" and, best of all, the simply enchanting "Holy, Holy, Holy"), some incredible orchestral playing and some superlative singing, none of which has yet been bettered. The interesting thing is that all these versions are in German. Now Mendelssohn, like Haydn and The Creation, conceived the work for the British choral society scene and originally worked from an English language text (although it seems both composers had a German translation beside them at every stage to help them get over linguistic hurdles). Somehow, though, both works sound more serious, more elevated and more coherent in German. I can't quite get to grips with why that should be; is it because we feel that German is a language more suited to being set to music than others (take the ridiculous spectacle of the Singapore Symphony doing Das lied von der Erde in Cantonese) or is it simply that both composers were working from seriously flawed English texts while the German translations avoided the more obvious solecisms? I wonder why it is, but I do urge you to listen to one of these recordings, even if you are still in that state of musical snobbery that believes that Elijah is not fit for human consumption. There was a time when, like its eponymous hero, Mendelssohn's great oratorio was regarded as vaguely ridiculous, a well-meaning attempt to bring Handel into the 19th century while self-consciously proclaiming the composer's Jewish ancestry and Christian beliefs. Its theology was questioned, its choice of texts scorned for their melodrama, and the musical language derided for being hackneyed and banal. Earnest English choral societies loved it because it sounded so grand yet placed so few technical demands on their voices, and provincial audiences adored it because it was so full of memorable tunes. 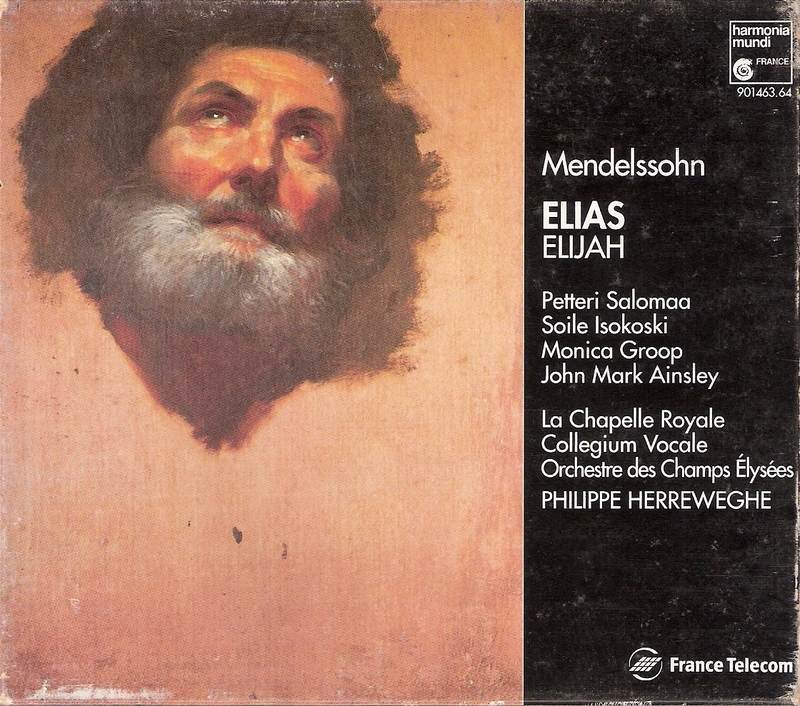 Occasional recordings, usually of the English language version, did little to endear the work to those who saw only its faults, and even the eccentric combination of a German baritone (Fischer-Dieskau, singing the role of Elijah with an undisguised German accent), an English choir and orchestra (what was then known as the New Philharmonia) and a Spanish conductor (Frühbeck de Burgos) on a 1968 Angel/HMV recording did little to dampen the disdain of the musical cognoscenti. 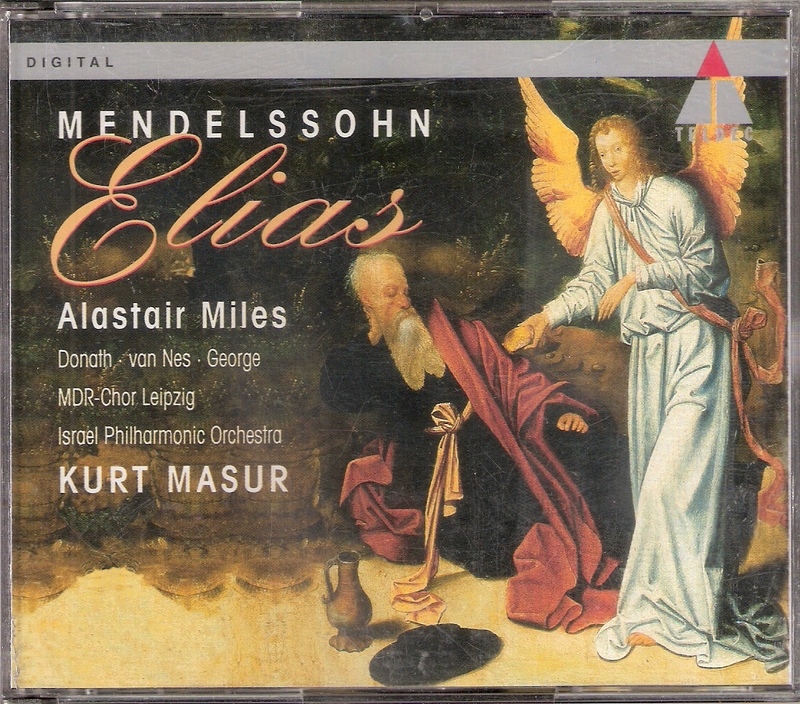 The fortunes of Elias changed dramatically in 1993 when two new recordings of the German version were released. For Teldec, Kurt Masur and the Israel Philharmonic Orchestra with the Leipzig MDR Choir brought out a performance of such towering authority, such musical integrity and such potent electricity that even the most hardened sceptics were won over, while for Harmonia Mundi, Philippe Herreweghe, the Orchestre des Champs Elysées and voices from La Chapelle Royale and Collegium Vocale added an extraordinary aura of intensity to a work previously regarded as the preserve of amateurs. 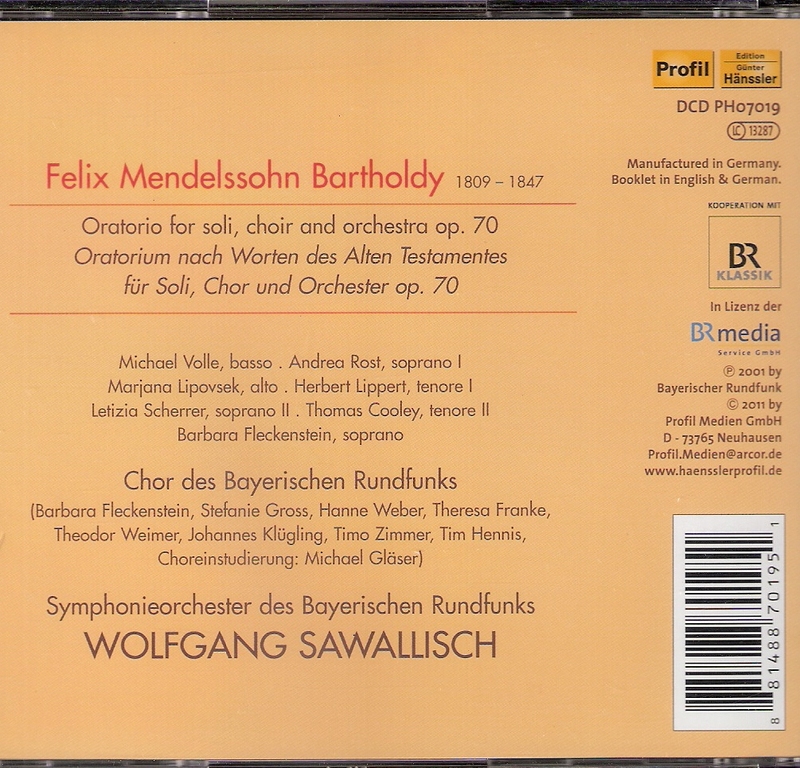 Many more recordings have come and gone since then, some worthy some downright silly, but with this new German–language release from Wolfgang Sawallisch and musicians from the Bavarian Radio orchestra and chorus, we have a very serious contender indeed. It's not exactly a new performance - it was recorded exactly a decade ago – but the re-mastered sound is vivid and fresh, and while I miss the presence of an organ adding its blast of air to the stirring "Und der Prophet Elias" and especially the innocent tones of a boy treble doing Elijah's cloud-gazing for him, this is a still a tremendous performance. Michael Volle is a relatively low-key Elijah, more compelling in his beseeching moments than when declaiming grandly, Andrea Rost and Letizia Scherrer intertwine angelically in the graceful "Herr, höre unser Gebet", while Marjana Lipovsek positively spits out the venom as Queen Jezebel in "Der Herr hat dich night". Herbert Lippert is pleasantly placid in "So ihr mich von ganzem Herzen suchet", and the closing quartet "Wohlan, alle die ihr durstig seid" is unquestionably one of the highlights of the whole performance. But while the soloists are a very good bunch indeed, what really distinguishes this performance is the choral singing, which is at times little short of spectacular; there's that spine-tingling moment as "Aber Einer erwacht von Mitternacht" reaches its breathtaking climax, while the valedictory "Als dann wird euer Licht" bustles along with all the heart-stopping excitement of the Kentucky Derby. 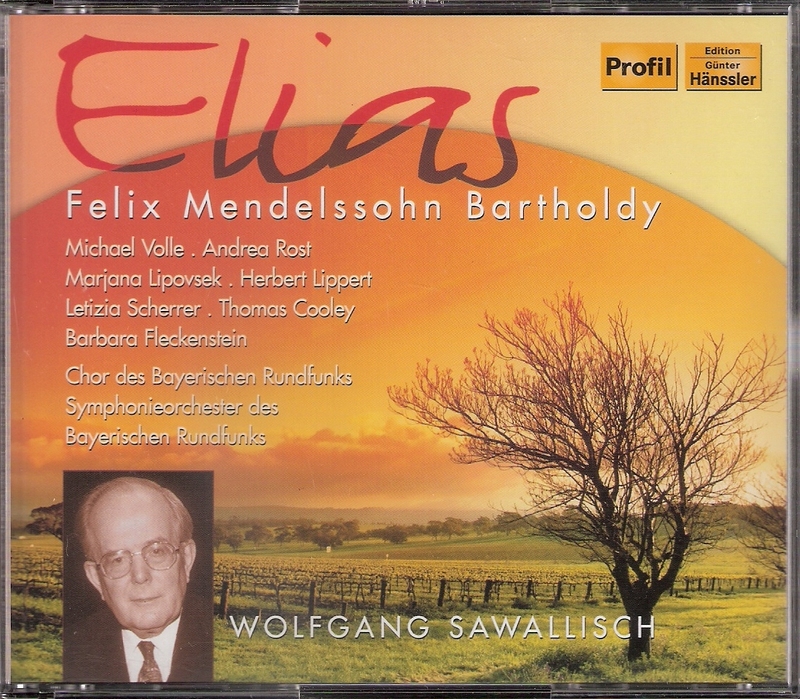 Firmly holding the reins and wielding the whip, Sawallisch proves himself here to be a masterly Mendelssohnian.